“Space is big. Really big. You just won’t believe how vastly, hugely, mindbogglingly big it is. I mean, you may think it’s a long way down the road to the chemist’s, but that’s just peanuts to space, listen…” Those words were obviously written by the brilliant, much-missed Douglas Adams in his classic Hitchhiker’s Guide to the Galaxy books. It’s an amusing way of trying to get across a truth that is genuinely vaster than we can possibly imagine. But don’t take Douglas’ word for it. Check out the 3D video map of the “nearby universe” up above, then see if you still think your commute to work is all that bad. The Cosmic Flows project set out to map our cosmic neck of the woods…in this case, that meant extending out to a distance of 300 million light years. That’s some stretch of woodland, I think you’ll agree. The result is a series of three-dimensional maps shown in the video up top, a digital recreation of “cosmic flows and the matter density in the local Universe.” The video clocks in at around 17 minutes, but if you’re a space junkie like me, it’s worth clearing some time to sit and watch the whole thing. While it’s really just a series of visualizations and narration, trying to wrap your brain around the immensity of what you’re seeing will likely blow your mind. We recommend having a backup mind on hand, just in case. 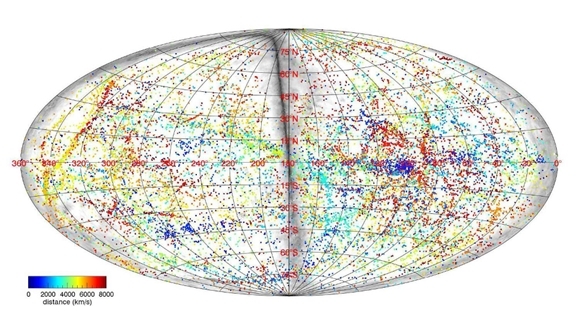 You can also check out an image of the cosmic map below. Those color-coded dots aren’t stars, by the way. Those are galaxies. The colors denote distance from our homeworld, with blue objects the closest and red the furthest out — again, some as much as 300 million light years away. And just in case you aren’t sufficiently humbled yet, here’s another factoid for you: that lovely image represents around 0.32% of the known, observable universe. The project unveiled the amazing video this week at the “Cosmic Flows: Observations and Simulations” conference in Marseille, France. Their findings will be published in the Astronomical Journal, but you can read more about the project right here. If you’ll excuse me, I need to go have a nice lie-down. Alright everyone. Remember where our galaxy is parked.